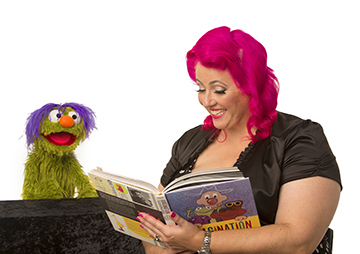 Every year, Book Week hits schools across Australia, and we all celebrate literature, illustration and storytelling through many mediums. 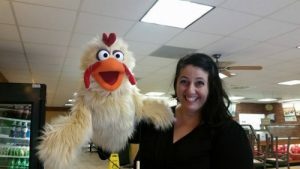 Puppetry is a great storytelling technique that can be helpful in sharing with children the joys of literature and education. Puppetry can be used to bring stories to life at any time or place and can really spark young imaginations. 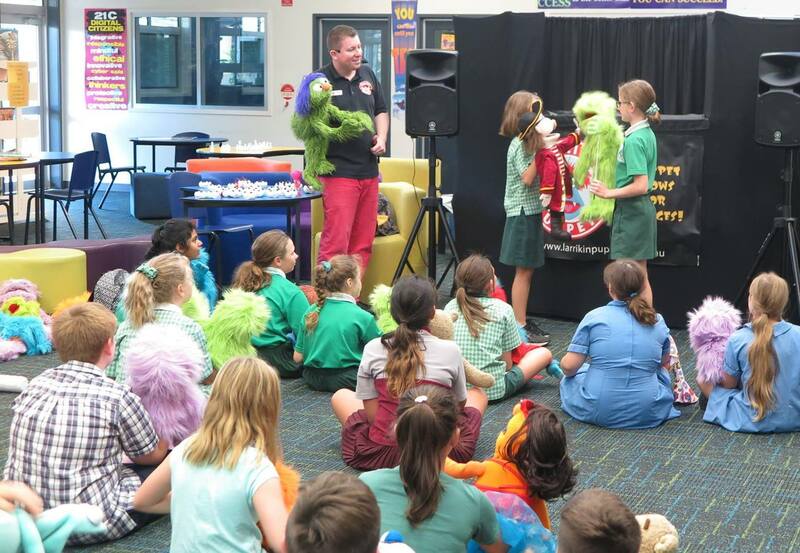 We can provide a couple of great Book Week options at schools. 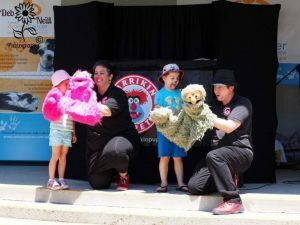 Our Story Time With Larrikin Puppets presentation is a 30 minute library story time puppet show with songs, skits and games plus a special storybook reading and interactive storybook sing-a-long. 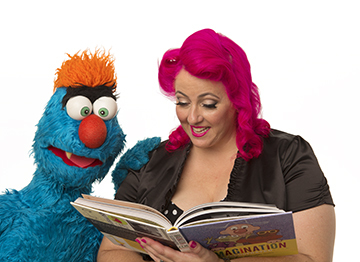 Story time facilitates adult-child interaction, pre-literacy support and communication development. During the library story time show, our lovely storyteller Elissa is joined by puppet characters Troggg and Frazzamatazz for the reading of a book by one of three Australian children’s authors that we’re working with – Hazel Edwards, Glenn Martin and Caroline Stills. We have books that are suitable for Prep to Grade 2 and others for the older students too. 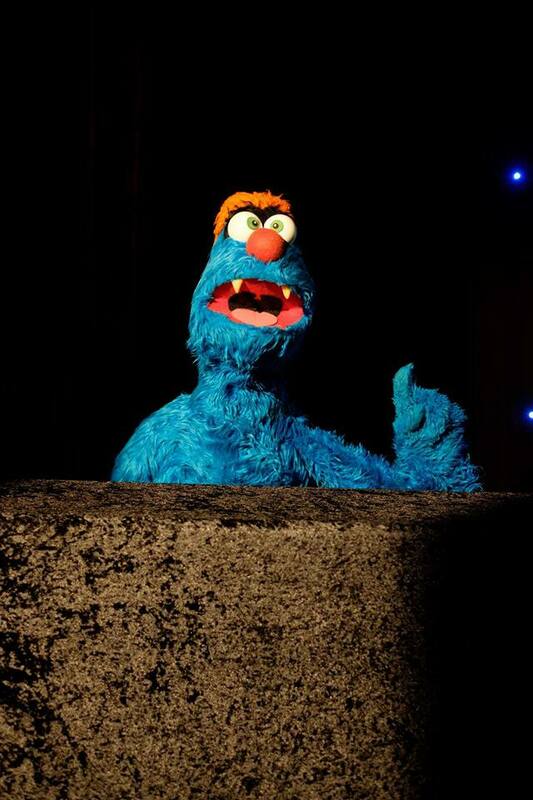 This is followed by a 5 minute demonstration on how the puppets work and a 10 minute meet-and-greet with the puppets. 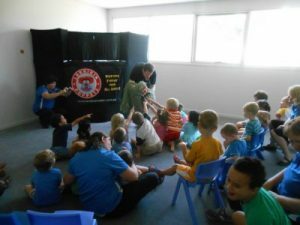 This presentation is perfect for Book Week activities. 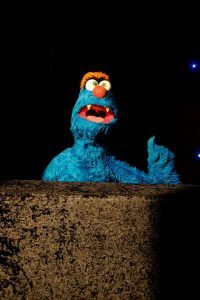 Another great Book Week idea for schools is to have a puppetry workshop where students can learn how to perform with puppets. In the session, we do a brief introduction to different types of puppetry (marionettes, shadow puppetry, glove puppets, ventriloquism), and then we learn about our form of puppetry specifically, which is the Muppet-style rod puppets and live-hands puppets first made famous by Jim Henson (Sesame Street, The Muppets, Fraggle Rock). 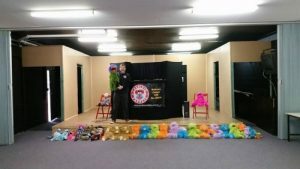 We cover the basic techniques – lip sync, walking, arm rod manipulation, and how to combine all of this with character voices to express emotions. 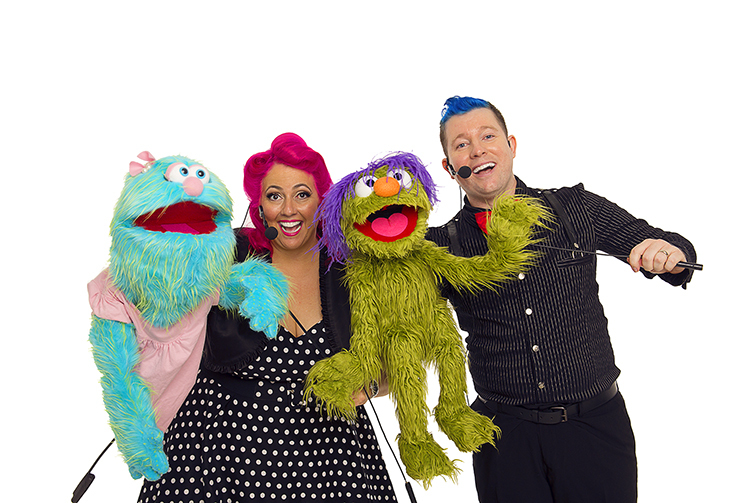 We also learn how to move the puppets rhythmically to music, while lip syncing. 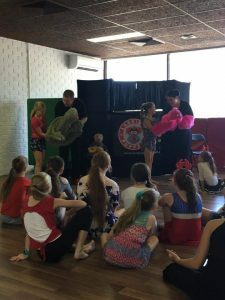 There will be an opportunity for volunteers from the class to perform short scenarios on stage to demonstrate what they’ve learned. We can even get them into small groups to come up with a story to perform with the puppets. And then if there’s time towards the end of the session, we have a brief Q&A at the end. Often the kids have interesting questions about how certain puppets in film and TV work (such as Big Bird). 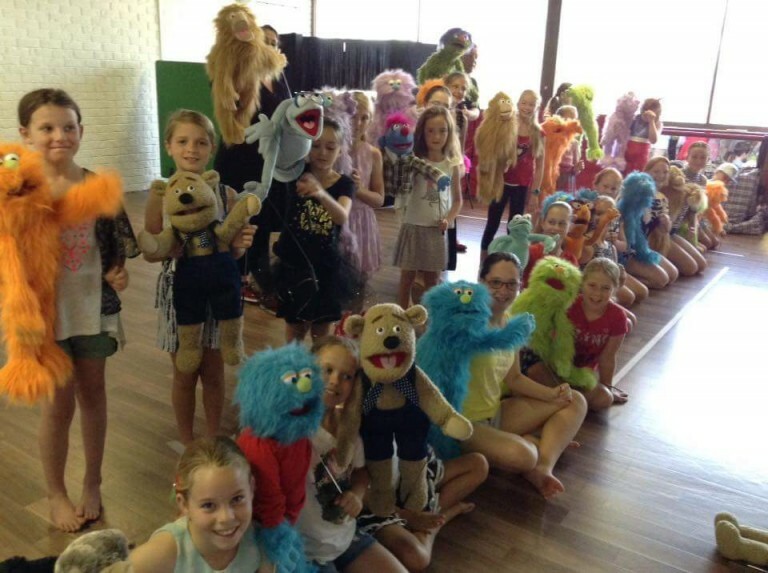 During one Book Week, we spent the entire week at Belmont State School teaching three puppetry classes a day. 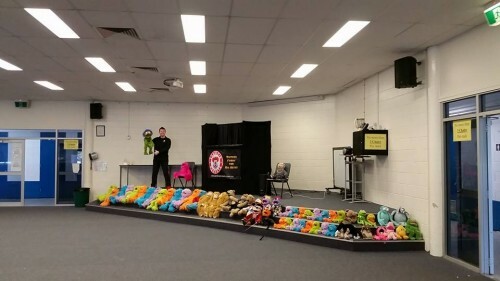 By the end of the week, all 1000 students from Prep to Grade 6 had learnt how to be a puppeteer in the Muppet style, and how to incorporate puppetry into their storytelling. 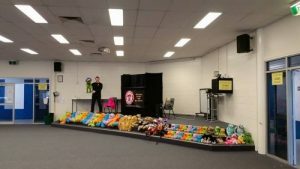 At a Book Week event held at St. John’s Anglican College in Forest Lake, we ran our workshop for students and parents at at very special 6pm presentation in the school library! Whether held in the hall, the activities room, the school library or a classroom, these Book Week puppetry workshops are very hands on, informative and fun. 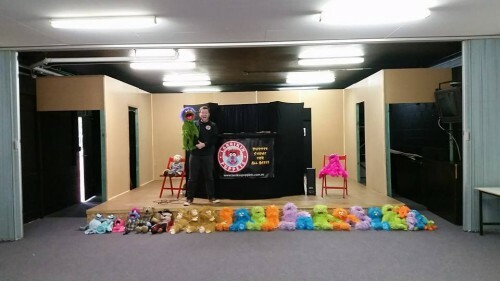 On the day, Brett and Elissa arrive about and hour and 15 minutes beforehand to sign in, load in and set up the puppet stage, sound equipment and all of the puppets ready for the workshop. Ideally 40 students per workshop. 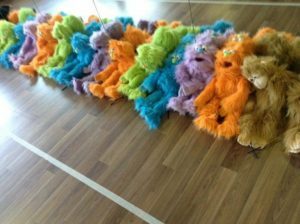 Happy to consider larger classes, but they would have get into pairs and share one puppet per pair, and each take turns for the exercises. This is what we did during the recent full week of Book Week workshops as each class had 50-75 students. 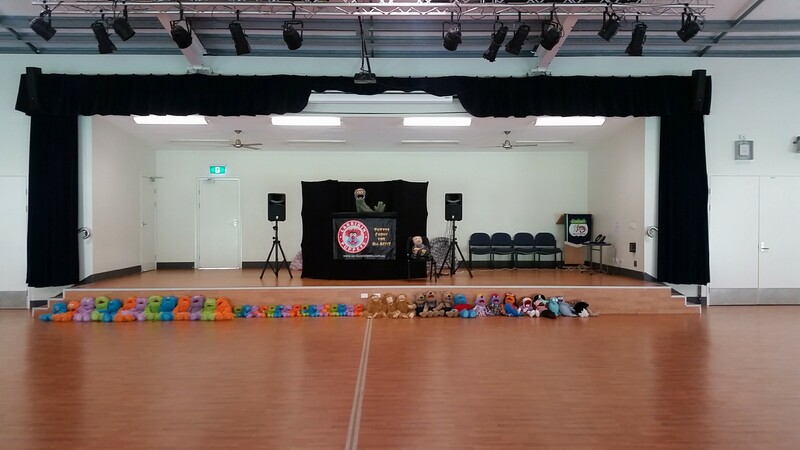 – Rehearsal and prep time prior to the event. Brett’s Blue Card number is 1161011/2, Elissa’s is 690261/2, and we have public liability insurance through Duck For Cover Entertainers Insurance. If there are any other queries, please feel free to CONTACT US HERE, or take the time to read our website’s FAQ page, outlining everything anybody could wish to know about Larrikin Puppets. And our Terms & Conditions, including a bit on adult supervision (or crowd control) during the sessions. Teachers usually participate in the workshops too, and help with behavioural management which is always very helpful. 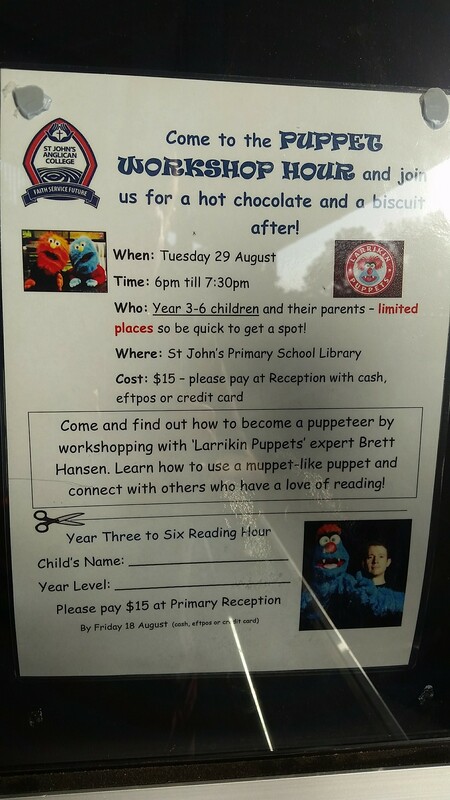 It would be great to come to your school to run this exciting puppetry workshop or perform our Story Time With Larrikin Puppets for Book Week!